Congress prepared to allow Obama to restore $1.5 billion in aid to Egypt, if it is proven that a democratic transition is taking place. Congress is prepared to allow U.S. President Barack Obama to restore $1.5 billion in aid to Egypt, AFP reported on Wednesday. A clause inserted deep into a broad federal spending bill, which is expected to pass as early as Friday, authorizes Washington to send $975 million to the Egyptian government. This could be activated provided the U.S. administration certifies that Egypt "has held a constitutional referendum, and is taking steps to support a democratic transition in Egypt." An additional $576 million in aid would flow if and when Egypt holds parliamentary and presidential elections, reported AFP. In October, the United States announced it would cut hundreds of millions of dollars in aid to Egypt over its displeasure with the military's pace of restoring democracy following the ouster of Muslim Brotherhood president Mohammed Morsi. 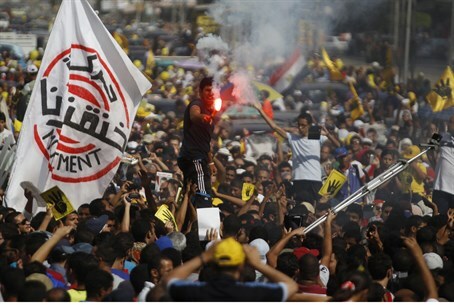 U.S. law forbids sending aid to countries where a democratic government was deposed by a military coup, though Washington has never qualified Morsi’s ouster as a "coup" and has been cautious about doing so, choosing only to condemn the violence in the country. U.S. officials, including key lawmakers, are keen to restore ties with a key Middle East lynch-pin, and they have seized on the constitutional referendum in Egypt as a turning point. The vote is expected to clear the way for defense minister Abdel Fattah al-Sisi to stand for the presidency. Washington has frozen the delivery to Egypt of major military hardware, including Apache helicopters and F-16 fighter jets, M1A1 Abrams tank parts and Harpoon missiles. But the administration believes the assistance is vital for regional stability and is in the interest of the United States, a position supported by many Democrats and Republicans in Congress, some of whom expressed their displeasure with the cutting of the aid soon after the decision was made. "Egypt is an extraordinarily important country to the national security of the area," Senator Dianne Feinstein, chair of the Senate Intelligence Committee, told AFP. At the same time, senior Republican Senator John McCain warned he would like to see "more conditionality" on the U.S. aid. "It's pretty clear that General al-Sisi will be the next president, but they're doing bad things, they are incarcerating people," McCain told reporters, according to AFP. "The constitution carves out a unique role for the military, and we should be conditioning our aid on progress away from these kinds of things rather than endorsing them," he added. Many U.S. lawmakers say Cairo needs to ensure stability in the Sinai and to respect the Washington-sponsored peace treaty between Egypt and Israel. The violence has continued in Egypt and has even worsened in recent weeks, since the interim government designated the Muslim Brotherhood a terrorist group and renewed the crackdown on its supporters.